Virginia will play in its first men's basketball national championship game after beating Auburn, 63-62, on Saturday in Minneapolis as 6-point favorites. The Cavs again advanced in improbable fashion. Virginia will play in its first men's basketball national championship game after beating Auburn, [63-62](https://www.thescore.com/ncaab/events/147723), on Saturday in Minneapolis as 6-point favorites. Kyle Guy hit three free throws with 0.6 seconds remaining for the Cavaliers after being fouled by Samir Doughty on a 3-point attempt from the corner. Was it a foul? You be the judge... <a href="https://twitter.com/si_ncaabb/status/1114681933991165953" class="embedly-card" data-card-width="100%" data-card-controls="0">Embedded content: https://twitter.com/si_ncaabb/status/1114681933991165953</a> Virginia shouldn't have even had possession for Guy's heroics (six points in the final 6.5 seconds), as Ty Jerome dribbled the ball off his foot and then regained possession and dribbled again, which should've been called a double dribble. <a href="https://twitter.com/BleacherReport/status/1114683741979336709/video/1" class="embedly-card" data-card-width="100%" data-card-controls="0">Embedded content: https://twitter.com/BleacherReport/status/1114683741979336709/video/1</a> Top-seeded Virginia (34-3, 25-12 against the spread), which was -330 on the moneyline and forced overtime in the Elite 8 on [a miracle bucket at the buzzer](https://www.betchicago.com/elite-eight-betting-recap-texas-tech-defense-gonzaga-offense-final-four), had a 10-point lead after Jerome's 3-pointer with 5:24 to play. But No. 5 Auburn (30-10, 24-14-1 ATS), which was +260 on the moneyline, went on a 14-0 run, including three Bryce Brown 3-pointers, to take a 61-57 lead with 17 seconds to play. 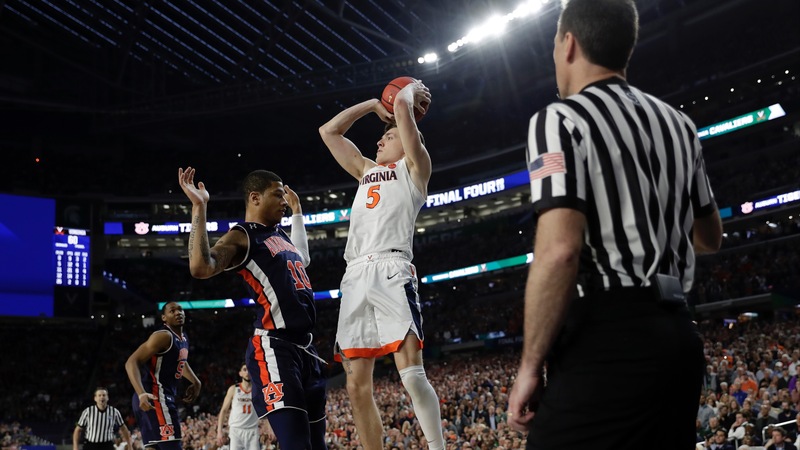 __MORE:__ [Our complete NCAA Tournament coverage](https://www.betchicago.com/ncaa-basketball-betting/home) Guy nailed a 3-pointer and Jared Harper only maade 1-of-2 from the line, leading to what happened on Virginia's final possession. The Cavs trailed 31-28 at halftime and were 5-point second-half favorites, but they couldn't cover that spread either, outscoring the Tigers 35-31 after the break. The game stayed UNDER its 132 (thanks to no overtime). ## Texas Tech-Michigan State No. 3 Texas Tech (31-6, 20-16-1 ATS) earned [a 61-51 win](https://www.thescore.com/ncaab/events/147722) over No. 2 Michigan State (32-7, 27-12) in the second game as 2-point underdogs, meaning whichever team wins Monday night will become the 35th school [to win an NCAA Division I men's basketball title](https://www.ncaa.com/news/basketball-men/article/schools-most-college-basketball-national-championships). The Red Raiders were +120 on the moneyline. The game easily stayed UNDER its 133.5-point total. The Spartans, who are the second best cover team in the country (Drake: 25-7), never had a lead after the 9:57 mark of the first half. They cut a 13-point Red Raiders lead to one (52-51) with 2:55 to play, but Michigan State didn't score again. Jarrett Culver, who had only one first-half point, scored seven points during the final run. The second-half line was Texas Tech +1.5 and it easily covered, 38-30. Underdogs are now 35-27 in the tournament, including 5-1 since the start of the Elite 8, and the UNDER is 31-29-2. __PLAY:__ Our [free daily contests](https://betchicago.chalkline.com) for the chance to win a BetChicago prize pack.